The Tigris River (called Dicle in Turkish) begins in the mountains of ancient Ararat and flows to the Persian Gulf. The Tigris is mentioned twice in the Bible. It is said to be the third of the rivers flowing out of the garden of Eden. It flows on the east side of Assyria (Genesis 2:14). The river is also mentioned in Daniel 10:4. The prophet stood beside “the great river, the Tigris.” Ancient Nineveh, near Mosul in northern Iraq, was built on the Tigris. The Tigris River south of Diyabakir, Turkey. Photo by Ferrell Jenkins. Ziyaret Tepe is identified with the Assyrian city of Tushhan. The city dates back to the Early Bronze Age (about 3000 B.C. ), but there is a concentration of interest in the Late Assyrian period, c. 882–611 B.C. This corresponds to the biblical period of the Divided Kingdom. Dr. Tim Matney, director of the Ziyaret Tepe Archaeological Expedition in southeastern Turkey, writes today about a visit to the source of the Tigris. 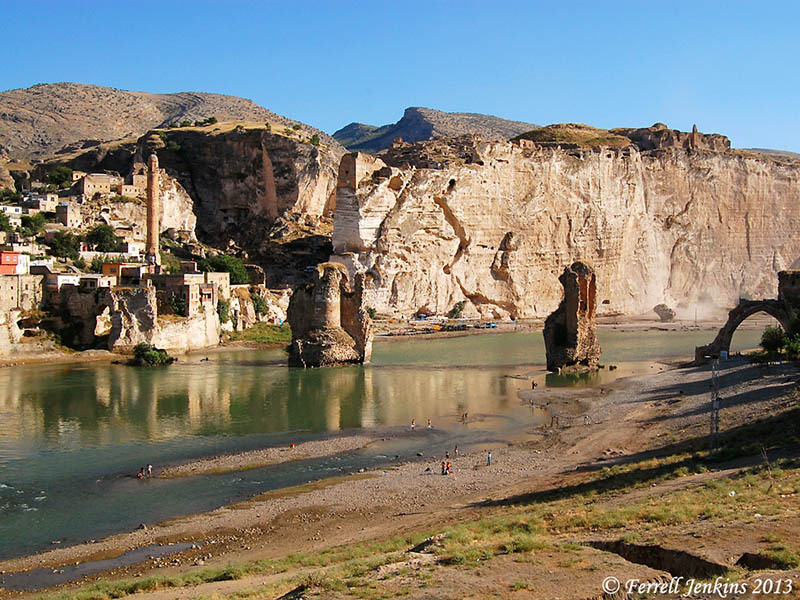 About 90km north of Diyarbakir there is a place in the Taurus Mountains where the Dibni Su, one of the two main sources of the Tigris River, comes flowing out of a large cave. The Dibni Su actually originates much deeper in the mountains, but the ancient Assyrians thought this to be the source of the Tigris and it is a dramatic landscape that had great significance to them. The modern name of the place is Birkleyn Gorge. Take a look at three nice photos posted by Matney at the Ziyaret Tepe website here. Ziyaret Tepe is scheduled to be flooded by the Tigris River as part of the project by the Turkish government to provide power and irrigation for the southeastern region of Turkey. I have not visited Ziyaret Tepe, but have visited the general area (Diyabakir, Batman, et al. The photo below was made at Hasankef, an old town also scheduled to be flooded by the Tigris. 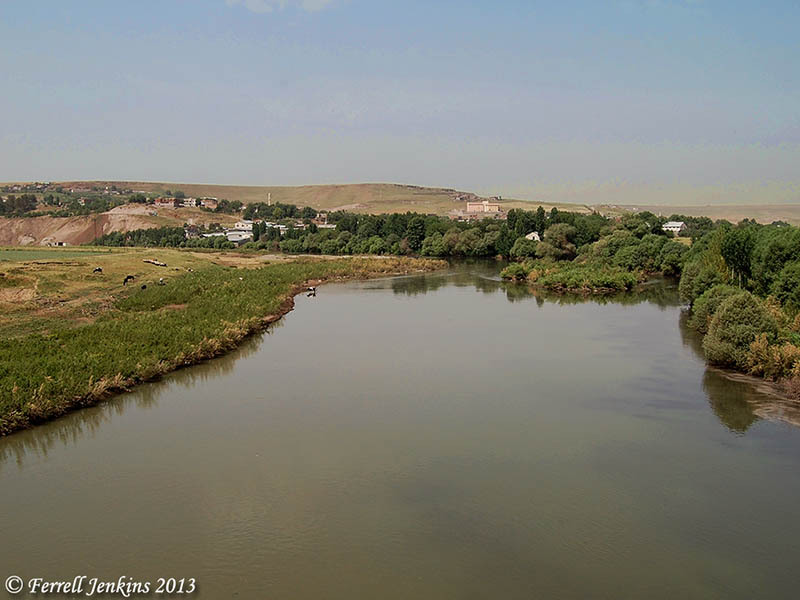 The Tigris River at Hasankef in southeastern Turkey. Photo by Ferrell Jenkins. In addition to the Ziyaret Tepe blog, there is an interesting report on the site, with maps, at Past Horizons. This entry was posted in Archaeology, Bible Lands, Bible Study, Old Testament, Photography, Travel, Turkey and tagged Assyrian Empire. Bookmark the permalink. A.D., thanks for the tip. The photos in the Revised and Expanded Pictorial Library of Bible Lands are in the Volume 9 (Eastern and Central Turkey). I would like to add the link to that site: http://www.bibleplaces.com/09-eastern-and-central-turkey-revised.htm. I believe there are actually five inscriptions: one of Tiglath-pileser I and four of Shalmaneser III. Accompanying the inscriptions are one relief of Tiglath-pileser I and two reliefs of Shalmaneser III. The University of Munich used to have a nice website about it in English, but it no longer appears to be active. The revision of Pictorial Library of Bible Lands includes about 17 photos along with notes on the Source of the Tigris. I am sure that you have a picture of Tiglath-Pileser III from the British Museum. I look forward to reading about him if you do write about him. Thank you for catching my mistake. You are correct, Fred. I use the dates of 745-727 B.C. for Tiglath-Pileser III, also known as Pul, and 726-722 B.C. for Shalmaneser V. This was just a matter of quick reading on my part. I wanted to comment on your latest post (The Assyrians at the source of the Tigris River) but I don’t have a Facebook or Twitter a/c so couldn’t post a reply. The photos are great and I enjoyed the info regarding the Tigris River but your references to Tiglath-Pileser and Shalmaneser in the Bible are misleading as they are not the same kings referred to by Tim Matney. The biblical references are to the 8th century BC kings with the same names, namely Tiglath-Pileser III and Shalmaneser V.
But I enjoy reading your Blog very much and will continue to do so!